If you don’t know, the BlackBerry Q10 LTE smartphone was released this year in January. According to Rogers Carrier, this smartphone will be available in their store this month in 2 colors, black and white, but at launch will be available only in white color. BlackBerry Q10 smartphone is compatible with 2600 MHz LTE Canadian network and is powered by 1.5 dual-core CPU and has 3.1 inches display with a cool resolution of 720×720 pixels (328 ppi pixels density). The internal storage of BlackBerry Q10 is 16GB and 2GB of RAM. The OS is BlackBerry 10. 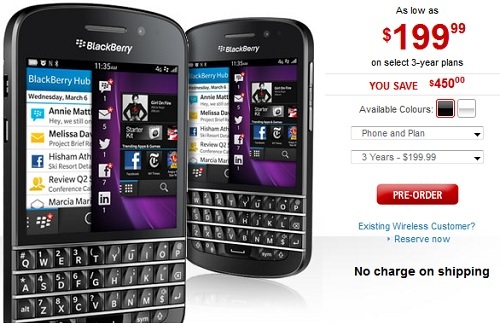 The price for BlackBerry Q10 on Rogers carriers is $199.99 with three year contract. You can pre-order now this smartphone via Rogers Reservation System.